Is your busy routine a hindrance to your workout schedule? Is your lifestyle restricting you from cycling, joining the gym, or going to a local fitness class? Are you interested in investing in a house-friendly machine that is easy on the pocket but it helps you keep in shape and sheds those extra pounds that you might have gained. Then you will be interested in the Sunny Health & Fitness NO. 059 Twist Stepper Step Machine, which we will be reviewing today. Now you might ask how is the twist stepper different than the regular stepper and what are its benefits. Well, we have the answers. It is a stepper and a twister! A two-in-one of sorts. As far as the straightforward description is concerned, the Sunny Health & Fitness No. 059 Twist Stepper Step Machine is a machine that simulates climbing a staircase but with an additional twisting motion that would be impossible to accomplish on a simple staircase or a simple stair-stepper. The Twist Stepper is as simple and compact as the regular mini-stair stepper, but the one distinctive feature that makes a gigantic difference in your workout is the pedal twist that takes place during the stepping action. This additional feature is an integral facility that engages the outer and inner thigh muscles and upper and lower leg muscles in heavy-duty exercise and it helps you attain the maximum out of your workout. Thus, the compact, yet durable and sturdy, machine provides you with a full-body workout—a feat that some of the best workout machines fail to accomplish. 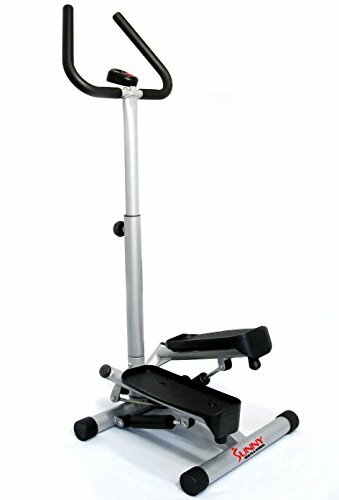 The twist stepper machine possesses the same stable and sturdy platform as the regular mini stepper or stepping machine but it is accompanied by two foot pedals that regulate the twisting of the machine. The twist action, which the machine imposes upon the body, tones and works leg muscles, thighs, bum muscles, and calves, which reduces the pressure on the bones and joints; the reduction in pressure enhances the quality, efficiency, and productivity of the workout. Thus, the Sunny Health & Fitness No. 059 Twist Stepper Step Machine is the ideal investment. The Twist Stepper comes with a multifunctional LCD computer, which presents and stores data regarding time, calories, counting, and scanning. You can intensify your workouts per day, and while the stepping action might lead you to thinking that you are not burning off enough calories, the counter will keep your faith intact. The machine also allows you to adjust the tension and resistance, so you can make amends to the intensity of the workout. Not a lot of machines allow this, so this is an added bonus of the Sunny Twist Stepper! The item provides the facility to adjust the height, and the handle bar provides balance as you use the machine. Since it’s lightweight and movable, you can move it around your house, from your living room, where you can watch television while you exercise, to your balcony, where you can sweat more if it’s hot and humid where you live. Records time, calories, steps, etc. So the question is, is this machine for you? If your busy routine confines you to your home or your office, then the answer is a resounding yes. You can place the machine in any small or compact place and attain a full-body workout. Secondly, for the impressive price and the intense physical exertion that the machine will subject your body to, we don’t see any harm in investing in a simple, sturdy, durable, and compact machine such as the Sunny Health & Fitness No. 059 Twist Stepper Step Machine. This model of the Twister stepper is a simple yet very effective when it comes to improving overall fitness of your body, and is best suited for home use as it brings all the benefits of taking a walk around the block or power walking, indoors. Being able to adjust resistance levels to make walking harder or easier, this machine can be set-up to suit all levels of user fitness.